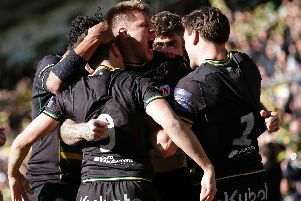 Stand-out Saints player Jamie Gibson has been overlooked for England's summer tour of South Africa with no member of the Northampton squad making the cut. Gibson, who looks hugely likely to be named player of the season at tonight's end-of-season awards, was unable to force his way into the back row picture. Instead, England have immediately handed Brad Shields a call-up, with the Hurricanes back row forward joining Wasps this summer. Saints' other most likely representatives in South Africa, Dylan Hartley and Courtney Lawes, are not considered for selection as both are injured. Hartley has concussion, while Lawes is recovering from a knee injury. Harry Mallinder was also not considered for selection. England will play South Africa in three Tests in Johannesburg (June 9), Bloemfontein (June 16) and Cape Town (June 23). And England boss Eddie Jones said: "It will be the most exciting challenge for us as a group since 2016. Three Saints players have made it into the 31-man squad which will train in Brighton next week ahead of the tour and England’s Quilter Cup match against the Barbarians. Paul Hill, Teimana Harrison and Piers Francis will all be involved ahead of the clash with the Barbarians at Twickenham on Sunday, May 27. Following the conclusion of the Premiership semi finals next weekend, a final training squad will be confirmed to prepare for the match.